Compartment syndrome is a complication of an existing injury, such as a significant muscle bruise or fracture. Bleeding and swelling of soft tissue increases the pressure within a limb. Loss of circulation, paralysis, reduced pulse and taut skin are the notable symptoms. The most common affected areas of the body are the forearms, the lower legs and the upper thighs. 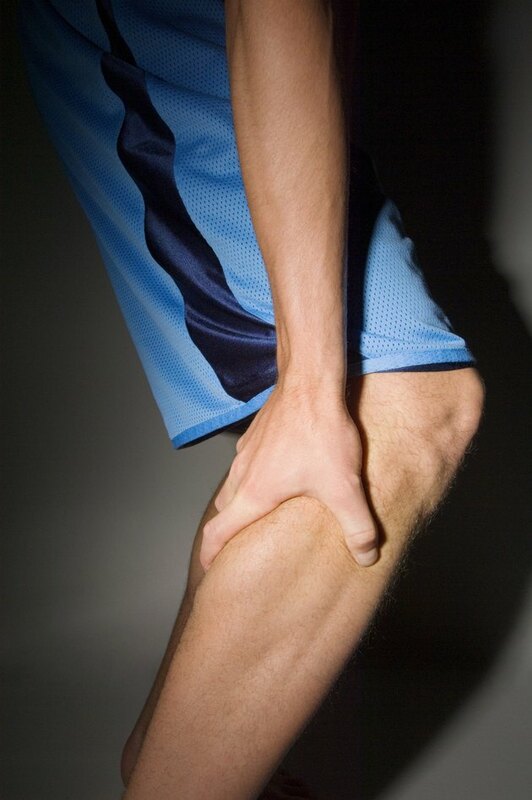 Stretching and light exercise may help alleviate some forms of compartment syndrome. There are two categories of compartment syndrome - acute and chronic. Acute compartment syndrome is less common and must be treated immediately. If the muscle tissue is without blood and oxygen for four to five hours it will die and a significant loss in function will result. A surgical fasiotomy that releases the pressure is often warranted for acute compartment syndrome, according to the "Clinical Guide to Sports Injuries." Chronic compartment syndrome is more common and is caused by sustained, repetitive activities, such as running. Symptoms often flare during increased training periods. For chronic compartment syndrome, stop the activity that is triggering the increase in symptoms. Treatment of chronic compartment syndrome begins with rest from the aggravating activity until the symptoms have dissipated completely. For many athletes, this means a significant break from their sport. Once the symptoms have left, modified return to the activity may begin. If you want to continue your sport, surgical treatment is the best option, according to "Current Diagnosis and Treatment in Sports Medicine." For chronic compartment syndrome, relax the muscles of the affected limb by lightly stretching. Continue with an ice massage to reduce swelling and pain. As an example, if the compartment syndrome is in the lower leg, raise your toes toward your nose for a count of 30 seconds. Then point the toes for 30 seconds. Repeat three to five times. Rest the limb comfortably and rub an ice cube along the tender muscles for five to 15 minutes. For chronic compartment syndrome, release the pressure of residual swelling by using a massage stick or foam roller to roll along the muscles. Begin by rolling slowly from the affected limb toward the body. Reducing the swelling and pressure of the muscles will alleviate pain. What are the Causes of Swollen Hands & Feet?